Where do you find your inspiration for your stories? I find inspiration in other stories, across all media. I used to write fanfiction as my start and AUs (alternate universes) were a big thing. What if the Avengers all lived in an apartment complex together, and all of their issues played out there? I watch movies and wonder what would have happened if Rose had scooched over and let the boy get on the door. I may not write that story, but it will spark another idea, perhaps about a couple abandoning a space shuttle but the escape pods are only meant for one of them. I get ideas from books, like Megan Whalen Turner or Dianna Wynn Jones and Neil Gaiman. Stories spark more stories. Tell me more about the book you have planned for release next year. Which one? I actively go between two or five stories to work on. Does this take me longer to finish a book? Yes, yes, it does. Is this multitasking style the best way to write a book? Probably not, but it’s what I do, and I haven’t been able to break myself of the habit. Out of all the ones I’m working on, I want The Howling Waste (working title) to be the one published in 2018 – of course I would love to get them all out and done this year too! Can you share an excerpt with us? Topher walked into the study and collapsed into one of the overstuffed chairs. He clutched at his shirt and forced himself to take deep, even breaths. “Elmore, come out of that bowl and stand like a man,” he said. The toad croaked and hopped up on its hind legs, its forelegs on the glass. With a powerful leap, he cleared the rim of the glass bowl. At the arc of his jump, his limbs stretched like puddy and his torso broadened and his head grew like child’s balloon all at once. The toad stood upright as a man, in form and mostly manner. He still possessed a hint of green to his clammy skin, and a wide gaze. It was rather difficult to tell whether the toad was a man or the man was a toad. Elmore Clark cleared his throat as was his habit and shook his head, as if clearing water from his ears. “You sounded like a loon,” Clark said. “Better than sounding like a suspect and having him seriously question me,” Topher said. “Houghton, get in here!” he shouted again. “Are you sure he’s gone?” Jessop Houghton asked. The dark young man slipped into the room, glancing around as if he expected the inspector to descend from the ceiling and seize them all. “I don’t know if my nerves could take that,” Houghton said. “Of course she’s coming back,” Houghton said. Clark made a derisive noise. Houghton looked to Topher for reassurance, but Topher dropped his gaze. Houghton nodded and paced the room. Topher watched him and Elmore from where he lounged in the chair, one leg thrown over the arm. He’d only sit like that if he were certain Lady Reginald was very far away, and not near enough to box his ears. Still, he glanced over his shoulder from force of habit. Recently, I’ve been binge-watching Miss Fisher’s Murder Mysteries and Doc Martin on Netflix. Or trying to. The episodes are very long, but I love it so it’s fine. I am also spending a lot more time planning using traveler’s notebooks. If you don’t know what those are, look up Chic Sparrow or Ali Brown on Youtube. The Thief by Megan Whalen Turner. I have to say this not just because I adore that book and Gen, but also because after I read that book, I determined that I would be an author. Megan Whalen Turner, Ted Dekker, Dianna Wynn Jones, and Neil Gaiman. I prefer writing at home, in my bedroom, at my desk or on my bed with the door closed and earphones in. however, my personal laptop does not function properly, and my writing process now is using my computer at work in between customers and hovering bosses. So that’s lovely. Physical paper in hand books, please. I will read e-books on my phone or tablet but I don’t own an e-reader. I’m not sure, what year is it? Eight years, I think. I didn’t start writing stories outside of school until 2010. Yes, the match checks out. Yes, about twenty. No, I’m working on twenty at the same time, but when I get one idea, that usually sparks three more. They’re all fantasy and sci-fi. 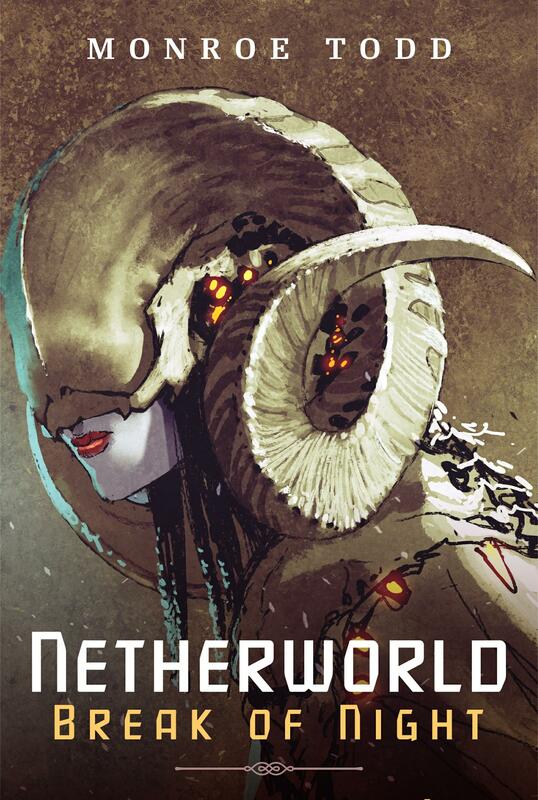 One book is a short of fantasy retellings, then there’s the YA space opera series, a series of epic fantasy loosely based off of Rumpelstiltskin – and I mean, very loose — another series is a weird western with angels, dragons, shapeshifters, and a witch. Oh, and the Greek inspired portal fantasy. 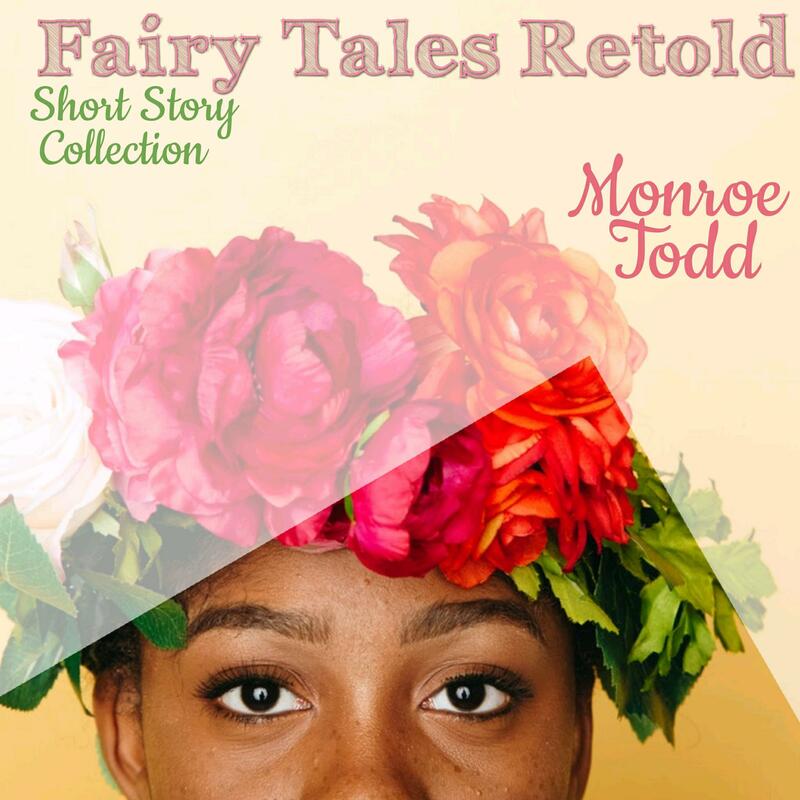 I told you, stories spark stories. It’s not ready yet! But once it is, you can find it exclusively on Amazon in e-book or paperback. Maybe audiobook too, down the line. You can reach me on Facebook, Twitter, Instagram, and my website. I’m not quite everywhere. How has your work as a teacher influenced your writing? My career as a teacher has influenced me, but not the teaching aspect. For over 30 years, I have worked with First Nations children and youth in six areas of British Columbia. Their culture has impressed me with how the people have used their natural surroundings to survive. The first book I wrote was a graphic novel which included native culture, and many of the characters were based on people I knew. They gave their consent to be a character. From your books, it seems that you’re very close to nature. Have you always been that way? Since I grew up on a remote farm, I have always been close to nature. Many of the places I worked in BC were very remote, some fly-in only. I have seen some of the most beautiful mountain scenery in BC. Working in Pacific Ocean communities has been great, with awe inspiring waves, rocky shores, and pebble beaches. In the Cassiar mountains of the north, I hiked to the top of mountains where I sketched wild flowers and mountain sheep. I don’t have a favorite book, but do have a favorite author, Jodi Thomas. She writes contemporary western romance. I like her so much that I asked her to be a character, the lady pastor, in my graphic novel. She said yes! My favorite place to write used to be on top of mountains, where I wrote poetry. Now that I live in Alberta, I write in an easy chair in my living room. The writing process starts with a concept that I mind-map around. When something grabs me or jolts my attention, I focus on that. Then I play the main scenes out like a movie in my mind. I am visually oriented, being first an artist, so I have to see all the scenes in my head before I can write them. Then I plot out the major scenes in a circle, with connecting lines between them, showing how each character affects others. This is the left brain work. Then I start writing directly on the computer. I make written notes to remind me of things I want to add, and personal drama between characters. The scenes can change, and new ideas come up, and even new characters walk in. These I jot down before forgetting them. 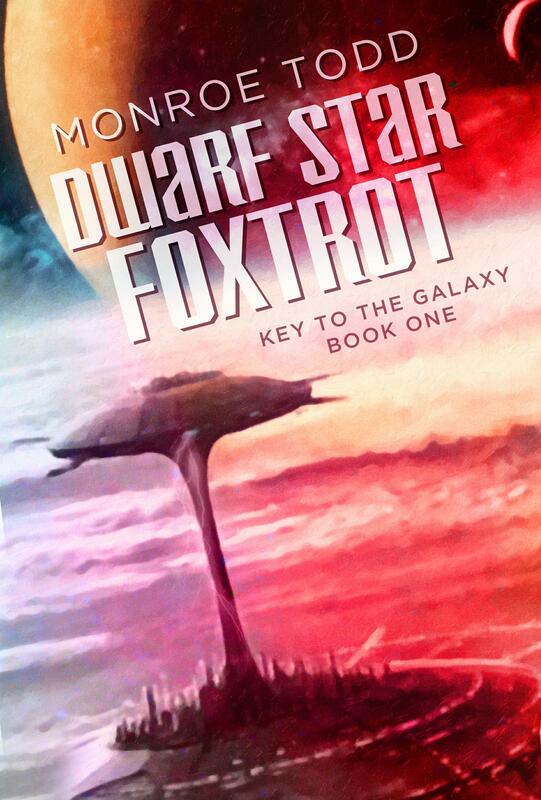 I only do real hard copy books, though I tried to add my books to Kindle, but that did not work. I have been writing for a long time. Initially, I wrote poetry, and some of it was published. Then I took a college fiction writing course from a lady who was a successful young adult writer. She was good at inspiring us to write short stories. Another distance ed course in fiction writing also helped. The main text was Fiction Writers Workshop, which I recommend to everyone. The book I am working on now is tentatively titled Mountains Where You Can Ride Horses. 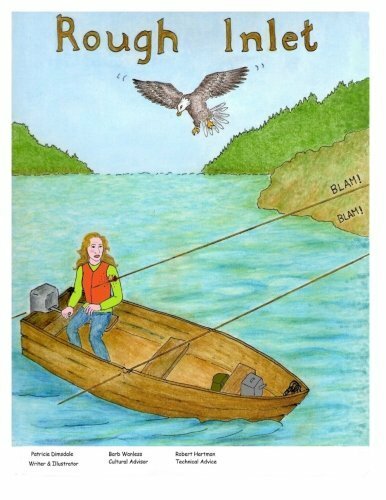 An accounting clerk quits her job, learns carpentry, and seeks to build a cabin by herself in the BC wilderness. 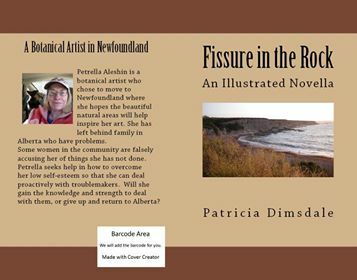 Be sure to check out Patricia’s books, Rough Inlet, Fissure in the Rock. You can find her on Facebook. What are Facebook Memories doing to our Actual Memories? I’m the first to admit that I adore the “On This Day” stuff from Facebook. I love that it brings up all my posts from that day in previous years. I get to admire my adorable children all over again, remember funny things they said that I had forgotten about, and of course see lots of pictures of my dogs. I’ve even fallen into the trap of feeling like I need to post good things that I’ll enjoy seeing again one, two, or five years down the road. Yep, they saw me coming a mile away. I’ll be using Facebook until I die. Unfortunately, I also remember lots of things that I didn’t want to remember or that really weren’t all that memorable in the first place. Who cares if I burnt the lasagna on November 17 of 2010? Well, I’m sure I cared that night, but I really don’t anymore. What this makes me wonder is if this is affecting how I remember things from my past. When I think about my childhood, it’s this series of bright images with a lot of emotions mixed in, lots of sunshine at the edges, and some really intense colors. My Facebook memories are only colored by what I posted. I feel like I’m remembering these things as posts instead of actual events. And then of course there’s the fact that not everything was recorded on social media. Unlike some people (and you know who you are) I don’t post every single tiny detail of my life. I’m not just talking about having a great sandwich but the ups and downs of relationships. It seems that the events I remember happening in my adult life (even once I had FB) that I did NOT turn into statuses are inherently clearer than those that I DID post. I can put myself back in those times and really feel what was going on inside me at the moment. The imagery, if you will, is much more intense. Does these mean I’m only posting inane stuff that I don’t mind sharing with the world instead of posting what really matters to me? I also have to wonder if I’ll forget things that happened in real life because I’m relying on Facebook to remember them for me. I can be pretty terrible at remembering to go to the post office or make an important phone call, and that has nothing to do with social media. Am I being affected by screen time? Is it dulling my senses to real life? What about my kids? What will their childhood memories be like? Let me know what you think. What do you do when you buy some ink that happens to come with a free pen, and you discover that you’re absolutely in love with said pen? You buy more ink, of course! I fell in love with the Charlie pen by Noodler’s that came with my purchase of Heart of Darkness. These larger bottles with pens were a special edition limited run, but they can still be found out there on Amazon, eBay, and several other sites. I couldn’t resist an ink named Dragon’s Napalm, and so I’ve now added it to my collection. As fun as it was to watch black ink slosh around inside the pen, it’s even more fun with Dragon’s Napalm, which is rather bloodlike. I can sign all my future contracts in blood now, yay! The ink comes out in a brilliant cherry red, reminiscent of dragons guarding their hordes of gold deep in the mountains of 1960’s fantasy novels. Like all Noodler’s inks that I have experienced, it flows well and is such a joy to write with. It’s perfect for proofreading or plotting the death of antagonists. What inspired you to write Let’s Sell Your First Book? I’ve been a part-time editor and book cover designer for the last six years now — going on seven years — apart from having a completely different day job. And in these seven years, I’ve worked with a multitude of publishers (big and Indie), authors, agents, fellow editors and every day I come across fresh writers who may or may not know how to write a book, but definitely struggle with marketing their product. Most of the existing “bibles” of book marketing are brimming with jargon and methods that sound like Greek to new writers. And that’s what gave me the idea to compile a book that is specifically targeted towards authors trying to sell their first book! Let’s Sell Your First Book! Marketing 101 for First-Time Authors will be out for pre-order now. What do you think makes a good book? In case of fiction, I think it’s a combination of a well-developed plot, a writing style that shows a great deal of command over the language and smart editing. For non-fiction, I lean towards preferring books that are well-researched, well-structured and those that focus on practical information. Do you feel your background in construction has influenced your writing? Oh, I started writing made up stories when I was six or seven. I used to be able to read a storybook once and be able to recite it page to page! I can still do that, actually, although not as accurately! My education as an Architect has definitely not affected my writing style. But I like writing pieces about real-life and human relationships and many of my stories, especially the funny ones, are inspired by real-life incidents that have taken place over the course of my career. I come from a family of foodies who talk about lunch while having breakfast and of dinner while having lunch. Each and every one of us travels just to eat, really. I started food blogging in 2009, also when I was starting to take my writing seriously and the idea of being a writer came about. It’s been fun combining my two of my three favorite things in the world, in one neat package at The Subjectivist. So many! The Fountainhead by Ayn Rand, anything by Chimamanda Ngozi Adichie or MFK Fisher. Are there any other writers in your family? Nope. Although, my mum and literally all my friends are avid readers! It looks like you travel quite a bit. Where’s your favorite place to be? I do have to travel a ton for work…or otherwise. Even though I wouldn’t mind getting away for a few days to a secluded log cabin embedded in snow, I’m a city girl through and through. New York, Paris, and London are my favorites. Just the hustle bustle, the colorful people and the possibility of an adventure gets me going. I also have a soft corner for Scotland. Both. I mean dogs. No wait, cats. OK, both. Arrgh, this is hard. What time of day works best for you when writing? What’s your writing process like? Afternoons work best for me. They’re quiet and are usually uninterrupted. I did, for a while, try writing early in the mornings, but I can’t for the life of me wake up early enough. I’m actually a pantser, most of the time. I don’t write chapter by chapter or sequentially. On the other hand, I don’t start writing unless I have a loose structure in my head. I’ll write according to whatever idea is the strongest in my mind at that point, and then piece the stories together according to the structure that will efficiently drive the story forward. I’ll then add layers and “meat” as and when required. 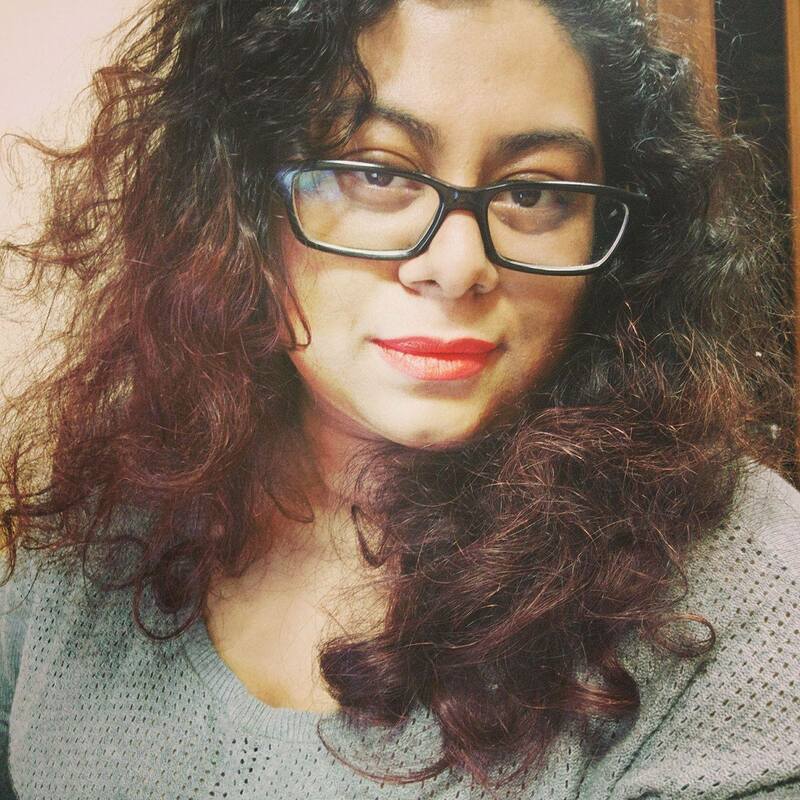 Be sure to check out Amrita’s Facebook and Instagram pages, as well as her website and blog. I’m starting to build up a bit of collection of fountain pen ink, and I’ve not been doing my duty in telling you all about it. Time for that to change! I admit I’d set my fountain pens aside for a little while. I hadn’t been keeping them properly clean, and I’d just been so busy that I hadn’t bothered. 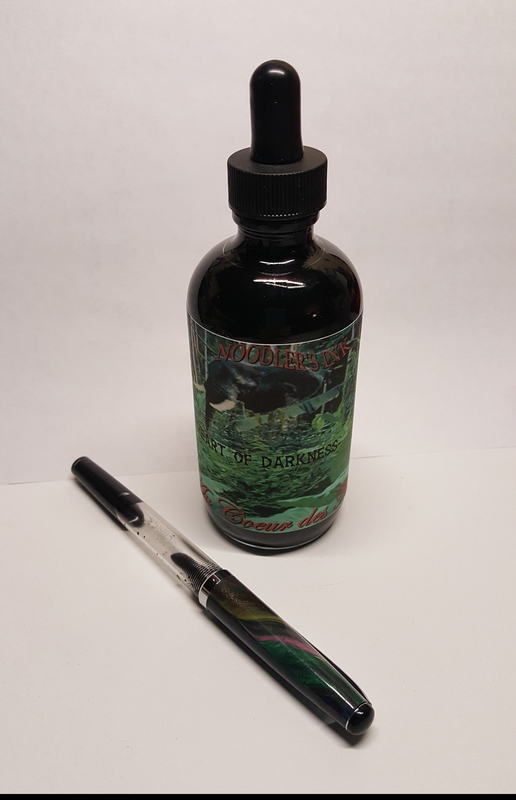 But I got a little Christmas money and decided to spend it on something that had been on my wish list for quite some time: Heart of Darkness by Noodler’s. Now, I didn’t just go and buy any regular 3 ounce bottle. No, I sprung for the 4.5 ounce bottle that comes with a free pen! Yay! The first thing I noticed when I opened the box is that this is one massive bottle of ink. I’ll go through an awful lot of character development and plot rearranging before I ever run out. The second thing I noticed was that the pen had no cartridge converter. I looked at for a full five minutes, taking it apart and putting it back together again (thinking at first that it was missing some pieces), before I figured it out. 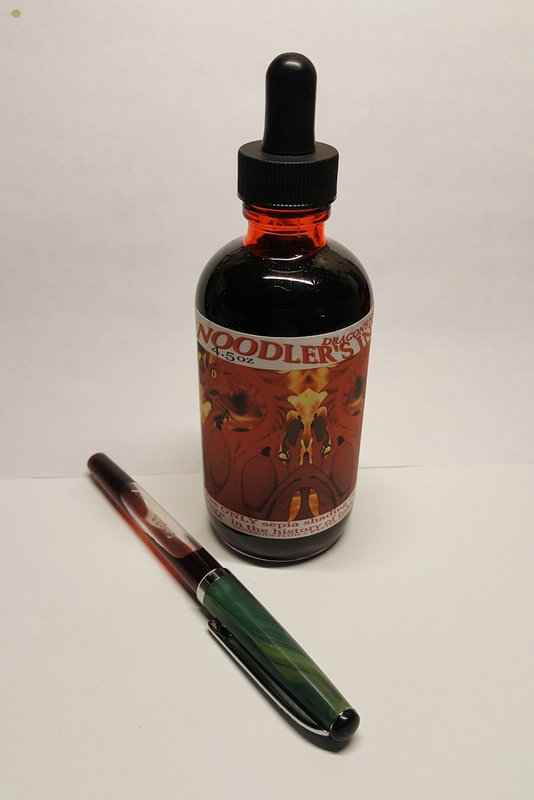 The Charlie pen by Noodler’s does not, in fact, have a cartridge converter nor does it need one. The ink is allowed to slosh around freely in the pen tube. A small canal cut into the side of the feed lets the ink flow down to the nib. This seems very efficient to me, since no ink is wasted inside a converter. It’s also a lot of fun to tip the pen back and forth and watch the ink when you should be writing. As for the ink itself, the name does a good job of describing it. This is a truly black ink, and one that is very satisfying to write with. There are no delicate color fluctuations to write about this time; it’s simply black. It’s a great ink for striking out your To Do list.